OK, so I’ve just written up a post on my main blog, Nothing Spaces, where I went on and on… and on about Aromateria. Aromateria is a local brand that makes solid perfumes. I was such a big fan of LUSH’s solid perfumes, annoying packaging aside, and I particularly liked Dirty, which is incidentally such a clean and fresh scent. I first heard about Aromateria from Sheena, who Instagrammed a few scents two years ago. I know both Eliza and Wiji are fans, too. Anyway, my lazy self and I only managed to take a whiff of these scents last week when I found myself at FIRMA in Greenbelt. I think they mainly operate online or at bazaars, so if you’re extremely picky about scents, I suggest you go over to smell them in person. Aromateria provides a list of their scents with the scent profiles, though, and for me, that’s already a good thing to go on when figuring out what scents to try out. Notice anything awesome? Yup, the scents are named after literary characters! Hold me. I picked up Ender, Hermione, Blue Oyster, and Sherlock, which I’m giving as a Christmas gift. My favorite scent is Ender, which actually reminds me a lot of LUSH’s Dirty. Ender (who happens to star in one of my favorite books) is made up of “stargazer lilies, sage, and white musk.” So good. Blue Oyster is sharp and fresh, made with “tangy citrus, marine, and sea salt.” It reminded me a lot of the scent profile of Jo Malone’s Wood Sage and Sea Salt—something that I initially liked but passed on because it smelled a little generic. I think I actually prefer Blue Oyster, which is a fortunate turn of events. Hermione is probably going to be a polarizing scent, since I don’t know very many people who can tolerate the sour brightness of pink grapefruit, though it’s sufficiently anchored down by the warmth of almond and honey. The solid perfumes are made with rice bran oil, the fragrance (duh), candelilla wax, castor oil, shea butter, and jojoba oil, and they come in Chapstick-esque tubes that are retractable. One of my biggest frustrations with the LUSH Solid Perfumes was their dinky packaging. When you pushed out too much perfume, you couldn’t really retract the tube and end up having to squish the product back in. With your fingers. 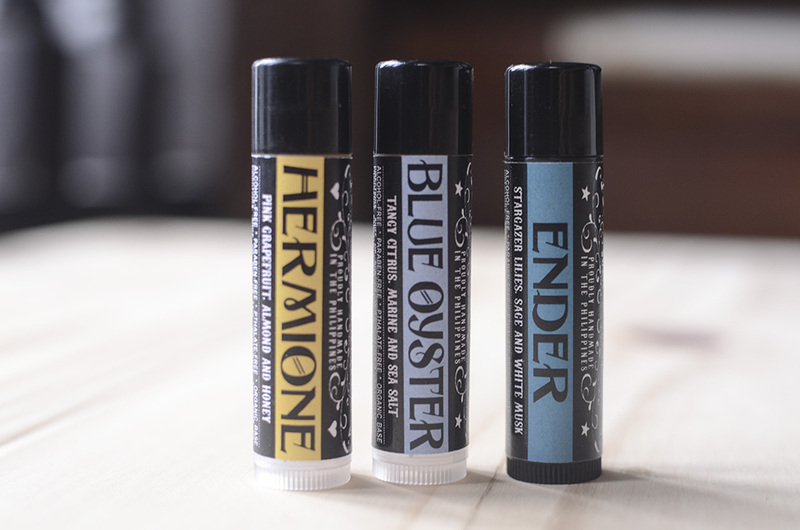 I love these because they are portable and travel-friendly, handmade and local, and also because the names and scents are so cool. Ever since I found Commodity Moss, a.k.a. the most perfect scent of all time, I had a hard time finding other scents that I liked enough to get for myself. Now, I’ve found 3. HEE. Oh, and the best part about these is that they are pretty cheap: Php 250 per tube, or a little over $6. Anyway, I love these so much. I have them by my table and take them out to sniff every once in a while, like a total crazy person. There’s truly a scent for everyone, I feel. I’ve got my eye on a few more but limited myself to these when I bought them. They have new scents! I picked up Isley, “ivy, sweet violet and fresh greens”, and it smells so good. I order online. I just read the scent descriptions tapos tiwala na lang haha! Ooh I’m a huge fan! The literary names are so good. I only have Hermione though which I bought at a 10 Alabama thing maybe a year ago, and I may have lost it recently (boo) so maybe I’ll pick up a different one when I see Aromateria stuff again/check out Firma. I love Hermioneeee! Hehe. It really dries down to such a pleasant sweet smell that’s not overwhelming once the grapefruit wears off. Let’s go to Aromateriaparadise when we go shopping!!! 😉 Haha BI! I went Hermione, Ender and Winterfell. I browsed the site — I think I’m going to hoard soaps! Already checked them out. Thanks for featuring them. I love Trese! Love sweet scents… Some of the scents aren’t available at AC+362 (?). Will check those at Firma next. oh! these sound really good!! 😀 Let me know if you want me to pick up anything for ya!